The road to Ocean was long and full of challenges. Spotinst started out, as most of you probably know, as a tool to manage Spot Instances. Over the years, that tool evolved into the DevOps platform it is today. Focusing on reliably running production workloads on excess capacity forced us to become the best at anything that had to do with handling interruptions, autoscaling, and workload placement. Over time we saw more and more of our customers leverage the automation and operations tools we’ve built in creative ways, that go beyond excess capacity and into the end-to-end optimization of their entire cloud infrastructure. Needless to say, we were excited. Our baby was all grown up. Ocean came about as the next logical step in the evolution of the Spotinst platform. Some of the smartest DevOps teams in the world were already using Elastigroup with Kubernetes, orchestrating containers in the most efficient way possible. But they wanted more, they wanted it to be easier, faster, and cheaper. They worked with us to build the next step toward a world where they don’t have to worry about infrastructure, and we couldn’t ask for better partners. Then we faced our next challenge, do we expand east and west, deeper into the public cloud, or do we head southward toward the Hybrid Cloud? The answer, of course, is that we do both! But which one do we tackle first? So we asked our customers and partners what’s going to move them towards where they want to be. We learned that many of the businesses that are planning or undergoing a cloud migration are struggling with understanding the impact of moving their on-prem Kubernetes clusters. They reported being in the dark about the utilization, cost, and performance, and that showback/chargeback was especially difficult when dealing with containers on-prem. With us just having built a system that gives you deep insights into Kubernetes clusters and helps you understand the economy of your infrastructure, Ocean’s on-premise support was born. Beyond offering the Serverless Kubernetes Experience on the cloud, Ocean is also a powerful prediction and dashboarding tool that allows you to gain deep visibility into the cost of running containerized workloads. Ocean gives you a clear, accurate, and actionable view of your container spend, on-premise or on the cloud. Ocean goes beyond visibility with the analysis and prediction of application costs, helping you make the right deployment decisions on-premise or on the cloud, at any given time. 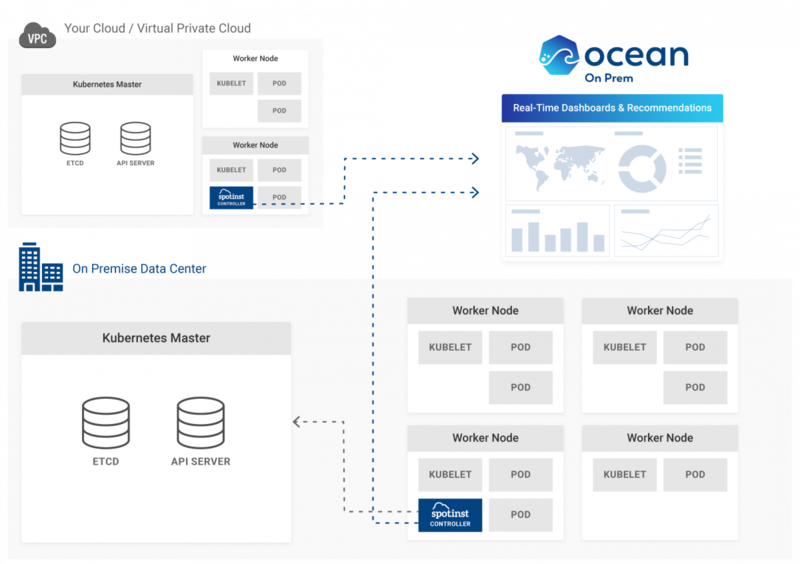 Ocean gathers data from all monitored Kubernetes clusters, regardless of where the cluster is deployed. After analysis, Ocean provides a consolidated dashboard for clear visibility into all clusters. 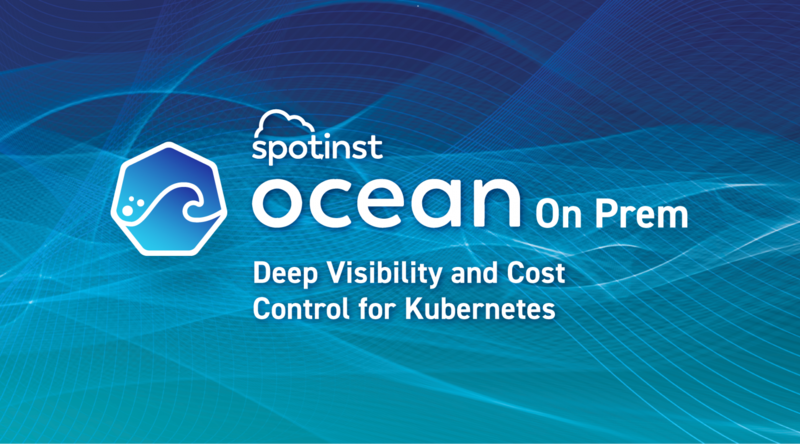 Utilizing Spotinst’s predictive algorithms, Ocean delivers recommendations on the most cost-effective deployment method for future workloads. With Ocean, your organization will gain deeper visibility and a reliable method for performing showback/chargeback on containerized workloads. 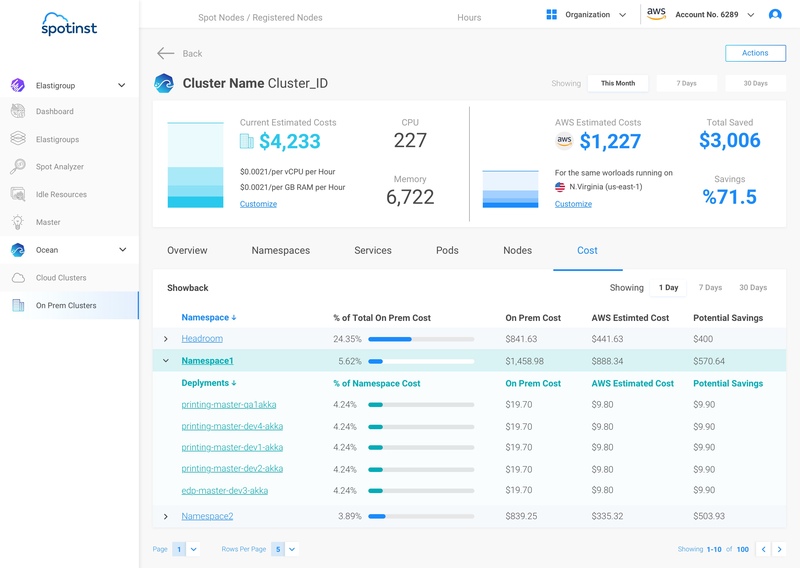 Ocean On-Prem gives you deep insights into the performance and cost of your Kubernetes clusters, and helps you understand the financial impact of moving your On-Prem clusters to the cloud. 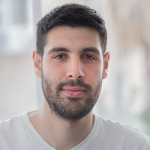 Ocean can be deployed in seconds to any Kubernetes cluster. Once deployed, Ocean provides real-time dashboards and end-to-end analytics on your containerized application costs. Go beyond visibility and recommendations by using Ocean with Elastigroup. Create a cost-effective, Hybrid-Cloud container strategy that ensures your infrastructure is always optimized for performance and cost. Use data on potential savings, historical costs, and efficient cluster sizing to make smarter decisions about running containerized applications on the cloud or on-premise. Gain greater cost visibility based on what matters to you – namespaces, deployments, or pods. Easily identify the best method for internal showback and chargeback in your organization. Ocean analyzes cost trends to predict the most cost-effective location for your workloads. Ocean’s powerful recommendation engine keeps you updated of all relevant considerations. Once it’s installed in your cluster, the Spotinst controller leverages encrypted, one-way, HTTPS communication with the Spotinst API. Ocean does not introduce any inbound connections to your datacenter or exposes it in any way. Ocean is available now to all Spotinst customers! In this first release, Ocean supports any form of Kubernetes on AWS (native, EKS, KOPS). Support for Google Cloud Platform and Microsoft Azure is coming soon. Ocean’s On-Prem features are supported on VMware datacenters. Take Ocean for a spin, get started for free, no credit card required! Once you’ve tried Ocean, we’d love to know what you think! The Spotinst Platform evolves along with its users and adapts to meet their needs. Ocean was born from listening to our customers and studying their needs while running thousands of Kubernetes clusters over the years, and we want to work with you to make the serverless container experience even better!